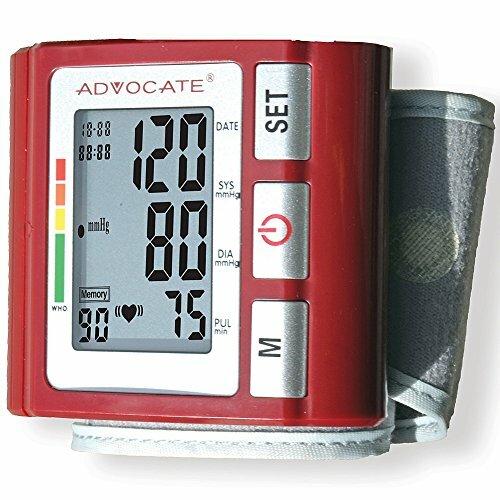 (Set) Advocate Wrist Blood Pressure w/ Convenient LCD Screen Monitor + AAAs by Johnson Smith Co. at Get Cheap Health Insurance. MPN: E52663 75847 P2. Hurry! Limited time offer. Offer valid only while supplies last. (Set) Advocate Wrist Blood Pressure Monitor + AAA BatteriesConvenient, portable blood pressure monitor delivers accurate readings in seconds. Convenient, portable blood pressure monitor delivers accurate readings in seconds. Features 1.5" x 1" LCD screen, 90-entry memory, fully automatic inflation/deflation, irregular heartbeat detection, and compact storage case. Approx 2.75" x 2.5" x 1" with attached wrist cuff. Fits wrists 5.5"-7.5" circumference. 3" x 3" x 2.5" storage case. Includes set of AAA batteries.